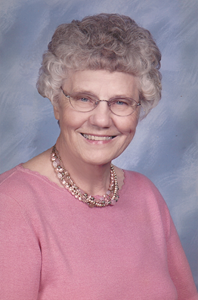 Deloris “Dee” Tader, 85, of Olathe passed from this world on Friday, February 12th, 2016. Dee was born on November 22nd, 1930 in Mora, MN to Alfred and Eva Selix, and grew up in Osseo, MN where she met and married the love of her life John Allen Tader. They lived in the Minneapolis area until 1975, when they moved to St Louis, MO. They moved to Olathe, KS in 1988, where they became members of the College Church of the Nazarene. Dee and John were blessed with eight children. She was the consummate homemaker whose gift of hospitality blessed so many of her friends and family. She found her greatest fulfillment in the role of a godly wife, and a caring, praying mother , grandmother and great grandmother. Dee still found the time and the love in her heart to care for scores of children as an in home childcare provider. Dee loved each and every one of these children as if they were her own, and was often heard praying for them and their families. Dee was also very involved with her church family and hosted Bible studies and events in her home. Dee was preceded in death by her husband, John; her son, Donald; her grandchildren Donald Jr., and Jill; her siblings, Lawrence, Audrey, Donald, Kenneth, Lyle and Gladys. Dee is survived by her children; Virginia Phillips, Sandie Montgomery, Barbara Gordon, Nancy (Russell) Schweitzer, John (Laura) Tader, Cheryl (Steve) Longley and Brian (Janice) Tader; 18 grandchildren and 19 great grandchildren; siblings Hazel Bolinger, Phyllis Clark, Marjorie Hakanson, Merlin Selix and Geraldine Hultburg. Add your memories to the guest book of DeLoris Tader. When I think of this special lady, I have such "warm fuzzies" for memories. She was always so cheerful, gracious, and never seemed bothered by a houseful of people (which is how I remember the Tader house). Her life was and is a blessing to all the people who were fortunate enough to enter her orbit. I will always remember the good times we shared! Although they were few and far between, they are always in my heart. Picking fresh raspberries in your Father's garden, running around your house as a child eating all of your after dinner mints, shopping for my 10th birthday present (a little white stuffed kitten), family dinners sitting at the kid's table thinking "I can't wait to be able to sit at the adult table", sitting in your lap at family gatherings, visiting the house that Grandpa built and meeting your dog "Genghis Khan", my first time holding a brand new baby (my cousin Elizabeth) was also at that house, being a back seat passenger in your car thinking "I didn't know Grandma was a race car driver" lol, my Dad teasing you about getting you racing gloves for Christmas, spending time talking to you at family reunions, and lastly talking to you on the phone last Saturday hearing the joy in your voice as you told me that you were ready to go home and see Grandpa. You are the matriarch of our beautiful family! You created quite a legacy through us all and I thank you for the love and good memories I will always cherish! The time has come for you to be reunited with your love and our Father in the grandest kingdom around! I'm sad that I cannot be present as your body is laid to rest, but know that I am there in spirit and send my love with my Mama! You will be missed and you are so loved! Rest in Paradise love! We count it a privilege to have known Dee. We came to know her through the prayer time on Monday nights. While we were in Brazil we knew that she, along with each person in this group, was praying for us. What an encouragement it was for us to know that these saints were lifting us up. She was a sweet woman of God. Our sympathies are with you at this time of your loss. A beautiful expressions of sympathy I received at the passing of my maternal grandmother in 1973 has been a constant source of comfort to me over the years. It states the obvious but assures us in these moments of separation and loss: "If those we've loved and lost are with the Lord, and the Lord is with us, then they cannot be far away." Bless you all and may the fragrance of Dee's life sweeten the living memories you carry in your heart. Doug and I are so sorry for your loss. Dee was such a wonderful and sweet example of a Christian wife, mother, grandmother and great-grandmother. I know your grief is great, but as John said on Facebook, heaven is so much sweeter now. Love your family!